Jessica Keenan Wynn, Lily James and Alexa Davies in a scene from "Mamma Mia! Here We Go Again." Mamma Mia: Here We Go Again opens with a Carter-era tune called "When I Kissed the Teacher" that is not very catchy, consequently obscure, in no meaningful way related to what is happening on screen, and desperately out of step with the current #MeToo movement. 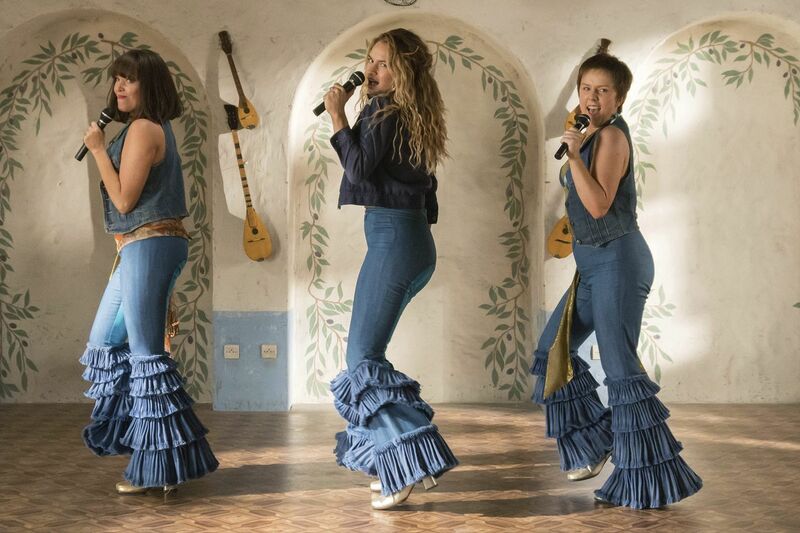 So the question posed by the idea of a sequel to the hit musical Mamma Mia – aren't they just about out of ABBA songs? – is answered almost immediately. Later, we are mistreated to song-and-dance routines built around "My Love My Life" and "Kisses of Fire," so be warned there are more than a few dead spots in Mamma Mia: Here We Go Again. Oh well, no one goes in expecting Sondheim, and whenever the filmmakers sense trouble, they simply form a full-cast conga line and replay "Dancing Queen." Other important ingredients also return – the movie's cast; its resolutely sunny disposition; and Greece, home to the seaside inn operated by free-spirited Donna (Meryl Streep), who, in the first movie, welcomes friends Tanya and Rosie (Christine Baranski, Julie Walters) and former lovers Sam, Bill, and Harry (Pierce Brosnan, Stellan Skarsgard, Colin Firth), all three credited with being father to Donna's daughter Sophie (Amanda Seyfried). In this sequel, Sophie has upgraded the hotel, with help from boyfriend Sky (Dominic Cooper) and a mysterious Latin gentleman (Andy Garcia). Director Ol Parker periodically interrupts the hectic run-up to the hotel's grand reopening with flashbacks that reconstruct the story of how Donna arrived on the island, and met the three men who make up Sophie's paternal triumvirate. Lily James is the young Donna, leaving college for a gap year that turns into permanent residence on the island, where her friends (the younger versions are Alexa Davies and Jessica Keenan) come to console her after star-crossed romance with shy Englishman Harry (Hugh Skinner), dashing Englishman Sam (Jeremy Irvine), and Scandinavian adventurer Bill (Josh Dylan). James turns out to be a good singer, though she looks nothing like Streep, even with dyed blond hair, and even when forced to wear Donna's signature overalls. So what's new in Here We Go Again? Cher does a couple of numbers, and there's a new tune from Streep, so we can report that rumors of her death have been slightly exaggerated. Richard Curtis (Four Weddings and a Funeral) has been brought in to class up the dialogue, and add some one-liners. He charitably gives the very best lines to the Greeks, especially the fellow who plays the ticket agent at the island ferry, a job he doggedly holds for 30 years. In addition, director Parker does some clever things visually – subtly swapping Streep for Seyfried in a couple of brief shots, reinforcing the spiritual, across-time dimension connection between the two characters. Theirs is the maternal love story at the center of the sequel, though other romances abound, star-crossed and storm-tossed, and of course miraculously resolved. For fans, there is enough ABBA energy to make up for those moments when you are convinced the musical has met its Waterloo. Directed by Ol Parker. With Amanda Seyfried, Meryl Streep, Cher, Pierce Brosnan, Colin Firth, Stellen Skarsgard. Distributed by Universal Pictures.